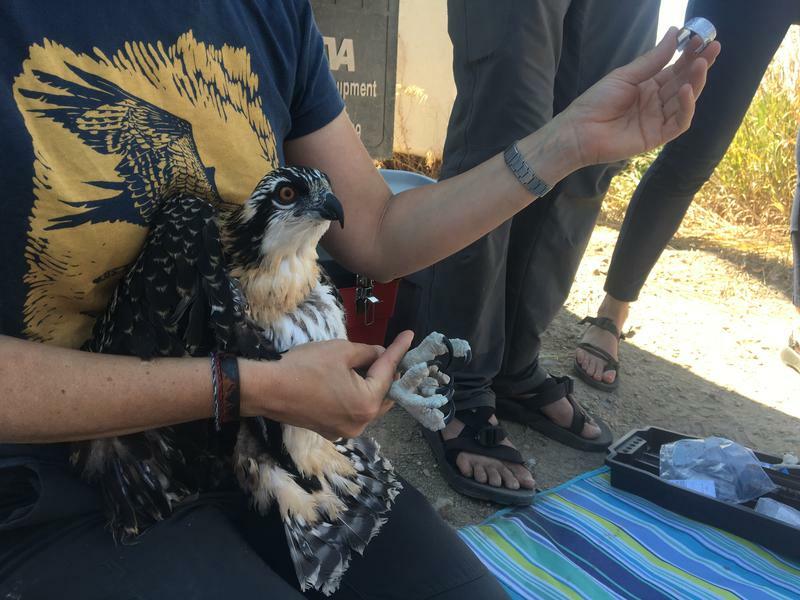 Dalit Guscio holds a two-month old osprey chick and prepares to take blood and feather samples. At a wastewater treatment plant along the Clark Fork River in Missoula, a mother osprey is flying in low circles above her nest. On the ground behind tanks of sewage, nearly two dozen elementary school kids, scientists, and a few employees from the wastewater facility watch as Dalit Guscio goes up in a bucket truck to look into the osprey nest. The nest sits on a manmade platform on top of what looks like a telephone pole. Dalit Guscio goes up in a bucket truck to see an osprey nest while a female osprey circles above. Guscio is the program manager for the Clark Fork Watershed Education Program. In the summers, she works with the Montana Osprey Project, leading field trips and collecting blood and feather samples. Before going up, Guscio warned a group of young campers from the Montana Natural History Center that she’s not sure what to expect. 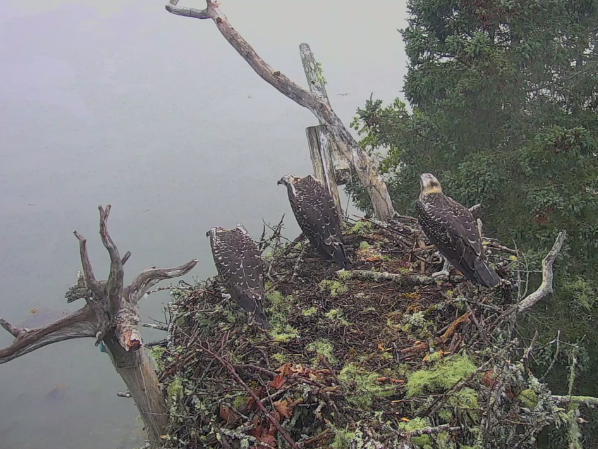 "We actually have not gotten our eyes on the osprey chick," says Guscio. "What I did see is projectile poop off the nest. So I’m assuming it’s there. That’s all we know, so we’ll see what happens, okay?" Raptors like osprey can have three or four chicks, but less than a third of those will make it past their first year, and Guscio often finds herself peering into empty nests, or going up only to discover dead nestlings. This year has been especially bad. "It’s been a hard season due to the flooding in this stretch of the Clark Fork and in sections of the Bitterroot," says biologist Rob Domenech. The Montana Osprey Project started back in 2006 when Domenech, the founder of the Raptor View Research Institute, teamed up with Erick Greene, an ecologist at the University of Montana. With money from the university, the Butte-area Superfund settlement and the Cornell Lab of Ornithology, they started monitoring osprey chicks. They collect feathers and blood samples from the chicks to test them for the presence of heavy metals like copper, lead and mercury. The ongoing study of contamination from mining brings raptor biologists to dozens of osprey nests each summer. Altogether they’ve tested over 450 osprey chicks. But Domenech says so far this year, they’ve only been able to get samples from about 15 chicks, far fewer than in past years. Domenech says what’s also unusual is the age of the nestlings they are finding. Usually, he says, the chicks will all be about the same age from nest to nest, but this year the hatching timing has been erratic. On the same day in nearby nests he’ll find a chick just emerging from an egg while other chicks are almost two months old and almost ready to fly. "The only thing that’s different year in year out is the excessive flooding, which we haven’t seen since 2011; and in 2011 we had the same sort of thing," says Domenech. "We had nest failures, we had staggered hatching dates between nests, and a lot of osprey that just didn’t seem to nest." As Guscio is going up in the bucket truck, Domenech and another wildlife biologist, Adam Shearing, are on the ground laying out a blanket and vials and other instruments for taking blood and feather samples, measurements, and banding the nestlings – if there are any– with blue and silver ID tags. 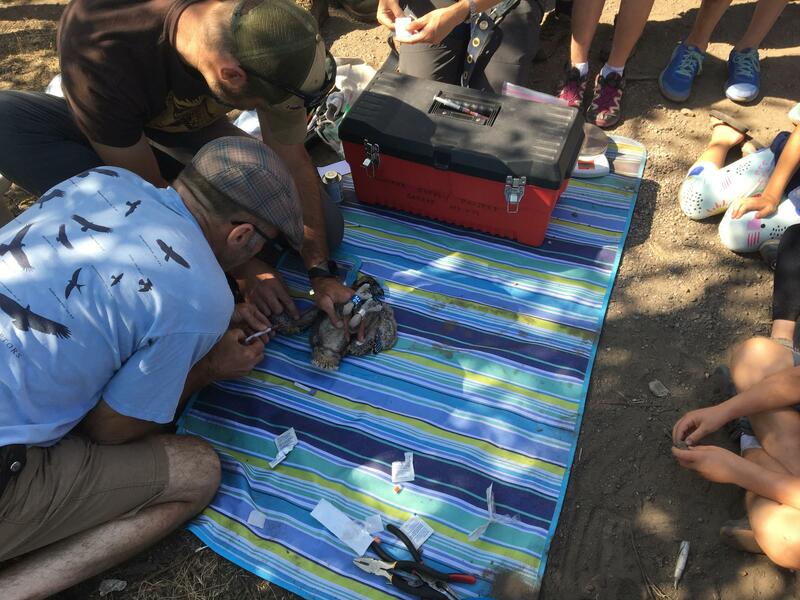 Rob Domenech and Adam Shearing take a blood sample from an osprey chick. Up high in the bucket truck, Guscio is smiling. She holds up two fingers. Guscio gets ahold of both osprey chicks and settles them onto towels in a gray rubbermaid container before bringing them down to the ground. This is Guscio’s fifth summer working with the Montana Osprey Project. She says osprey are a great way to check on the impacts of mining in nearby waterways because they are at the top of the food chain and osprey chicks are fed entirely on fish from within a mile of their nest. "The problem with heavy metals is we ingest it, but we can’t excrete it, so it stays in your system," says Guscio. "And so the further up you go in the food-chain, the more units of the heavy metals you have in your system, and so we look at them to see how contaminated our rivers are." The chicks that Guscio pulls out of the rubbermaid container now are mottled, grey and brown with sharp beaks and wide, round, orange eyes. They are each the size of a football, with flopping, uncoordinated wings, and large feet and talons, that Domenech says, like puppies, they will someday grow into. Domenech thinks these chicks are about two weeks old. As he, Guscio, and Shearing get to work weighing and banding the birds, they talk through what they’re doing with the campers circled around them. A biologist with the Montana Osprey Project weighs an osprey chick. Some of the kids here have been on field trips with the Montana Osprey Project before, and chime in. Guscio says community outreach is a huge part of the osprey project. Funds from the Natural Resource Damage Program (NRDP), the state’s environmental remediation program, go towards bringing in summer camps like this one and teaching about the lasting environmental impacts of mining. 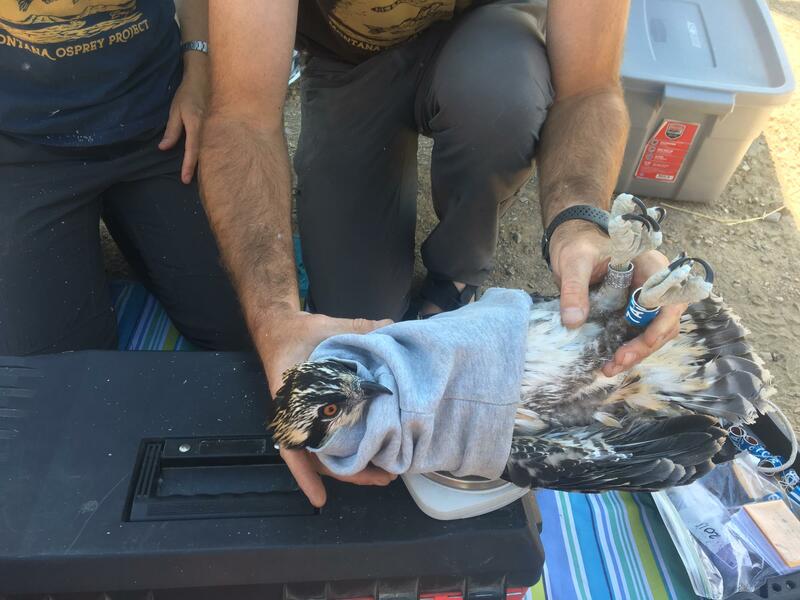 As part of their educational efforts, the Montana Osprey Project even installed two livestreaming nest cams to help connect with a larger audience. Guscio says this year those nest cams helped biologists observe behaviours they’d never seen before. "What we’ve been exposed to until this year is that the female is always sitting on the nest and feeding the birds, but the male is most singularly responsible at fishing and bringing the fish to the nest," says Guscio. But this year, a nest cam showed the female also leaving her chicks multiple times to go hunting and returning with fish. "So both parents are making the effort to go and fish," says Guscio. According to Guscio, this is likely because of how severe the flooding on parts of the Clark Fork was this year, making it hard for the osprey to feed their chicks. "And so the river’s really high, it’s really fast, it’s really turbid, very hard to see fish," says Guscio. 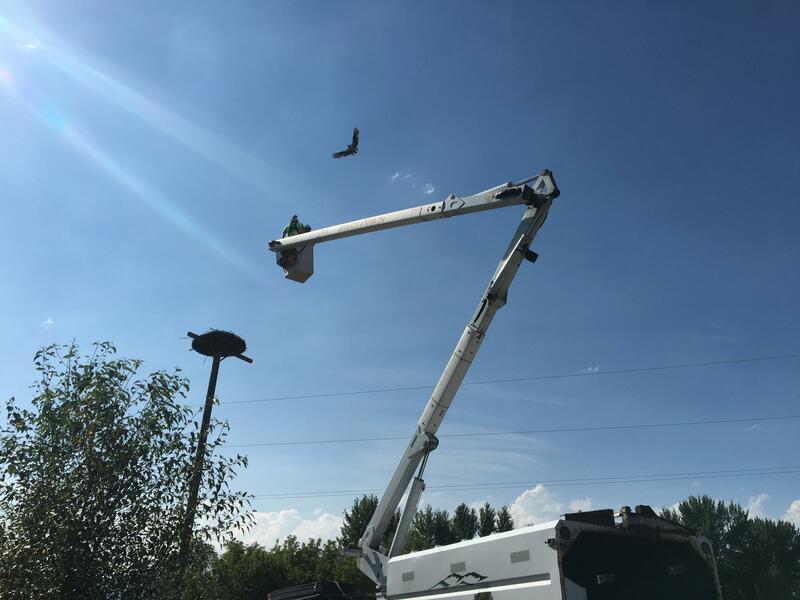 At the water treatment plant, as the chicks are returned to their nest, and the bucket truck backs away, the mother bird circles back down to check on them. On a tree 100 feet away, her partner, the male osprey, keeps an eye on things as the scientists pack up. Domenech says he doesn’t know if these chicks will make it or not. "It’s hard not to root for the underdog – they’ll make it, I think they’re gonna make it," says Domenech. "A lot of times I find myself wanting to be a little more positive than maybe I should be." But maybe Domenech is right to feel a little optimistic, even after a bad season. After all, this year, for the first time since the project started, two tagged birds have returned from their migrations and set up nests of their own. "And both were banded in 2013 on the same day," says Domenech, "J6 and J4. 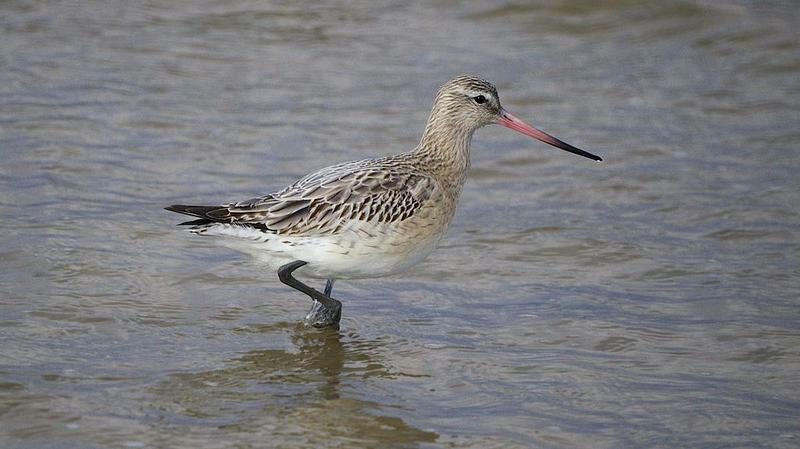 I mean of 450 birds, this is our first breeding record. So it really gives us an idea of how hard it is for these young osprey to actually make it to be contributors to the population." The American bald eagle, once near-extinct, is back with a vengeance. And there's a rare — and frankly, brutal — video, perhaps the first-ever footage of osprey predation by an eagle in Hog Island, Maine, to prove it.